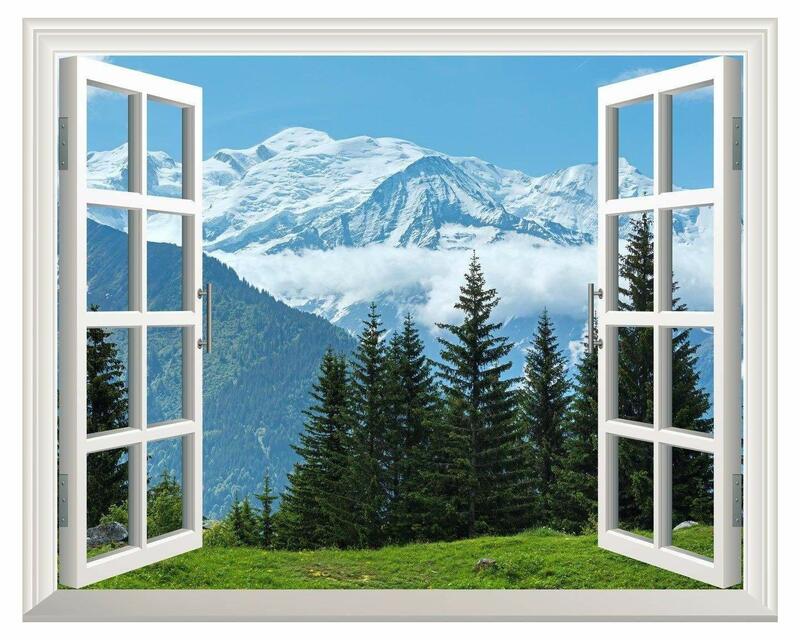 wall26 Removable Wall Sticker/Wall Mural - Snow Mountain and Pine Trees Out of The Open Window Creative Wall Decor - 24"x32"
This view of the outside is a great addition to out travel trailer. no window in your office..... well you can have one now. Love it. I’m looking forward to decorating a special wall with this. It looks a little more digital than expected, but the colors are very nice. The material is nice and sturdy too! My desk is placed directly against an old wall and made me to feel a little claustrophobic so I looked into a variety of wall murals, finally choosing the 3' x 4' Daisy Flower under Blue Sky Open Window. I half expected the guys to make fun of me but just the opposite happened. Technicians and vendors alike have stopped to make positive comments. One even warned me that my window was open - just before it rained. As for me . . . It is nice to look out into a calm blue sky and, yes, it took care of my claustrophobia. Note: After considering the directions, we opted not to use the peel and stick backing; instead just attaching it with stick pins. This allowed us to move it several inches to the right (when I discovered it didn't work where we originally placed it) and hopefully prevented future wall damage and bubbles. I've purchased 2 of these, the first one I hung above my bed I did not stick it to the wall just tacked it.... Because I may be moving soon and didn't want to take the chance of ruining it by taking it back down. I love mine so much I ordered one for my relative who was having to move away from the coast ... Giving him a beach view even though he no longer lives there! Really takes two people to hang, I did it by myself and it was a little tricky. Love it! Pops on a white door. I have it in my office and clients love it. Absolutely gorgeous artwork. The one negative was that it sticks to the wall so hard and fast, there is no adjusting. If you make a mistake, it is just too late and too bad. It will rip the wall if you try to pull it off. Place it perfectly the first time and it is lovely.